In a bid to avoid the continuously closing fate of chains like Joe’s Crab Shack, Outback Steakhouse, Bob Evans, and Logan’s Roadhouse, seminal restaurant chain Chili’s is downsizing — its menu, that is. Chili’s Grill & Bar parent company Brinker International announced today that it would gut the chain’s menu by nearly 40% in an attempt to focus on the quality and size of the meals that customers actually order. At its peak, Chili’s offered one of the largest menus of any restaurant chain with more than 125 appetizers, entrees, desserts, cocktails, and add-ons. “After a lot of self-reflection, we’ve realized something you may already know — in restaurants as in life, you just can’t be everything to everyone,” the company said. While the company realizes that some guests might miss departed menu items, it believes the improved quality of its remaining dishes will be enough to draw in customers. 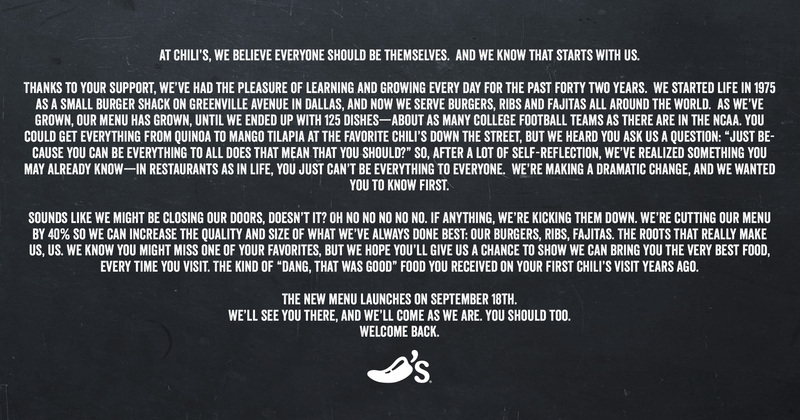 “We apologize to any Guest who misses a departed dish, but with this bold move we commit to all guests to do a better job of serving our famous food on every visit, in every restaurant,” Kelli Valade, president of Chili’s, said in a statement.